The Abundant Mentality – Challenge! 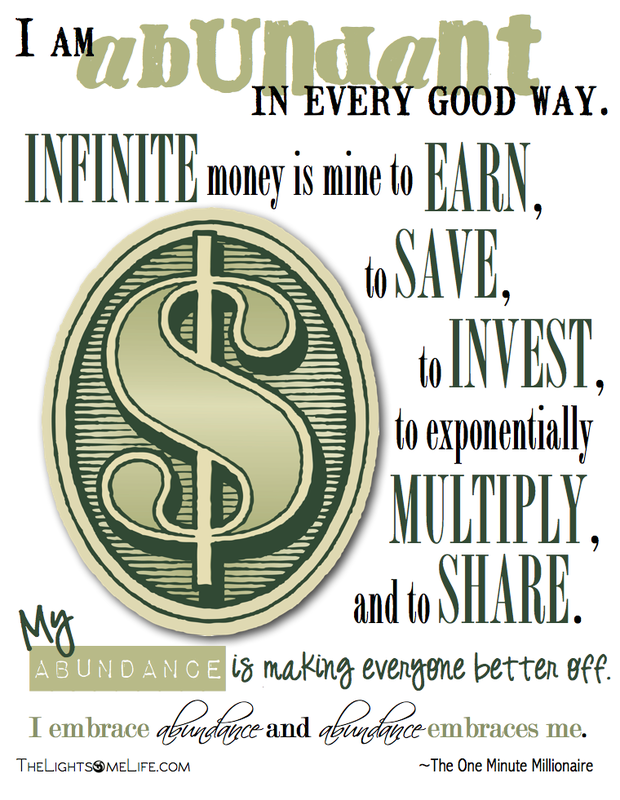 This month is the perfect time to discuss MONEY and ABUNDANCE! 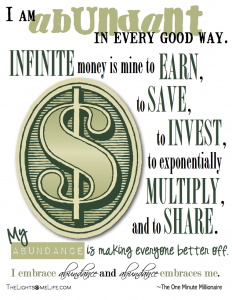 We know that there is much more to an abundant life than just money, but this is where we will start. With St. Patrick’s day coming up, it seems appropriate to point out how Leprechauns live a life of abundance. 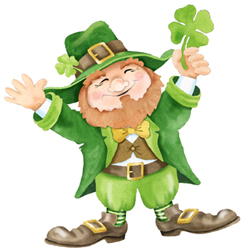 Did you know that a Leprechaun carries 2 different coins in their purse? One dummy coin that turns into a rock once the leprechaun gives it away, and another magic coin that always replenishes after it has been spent. 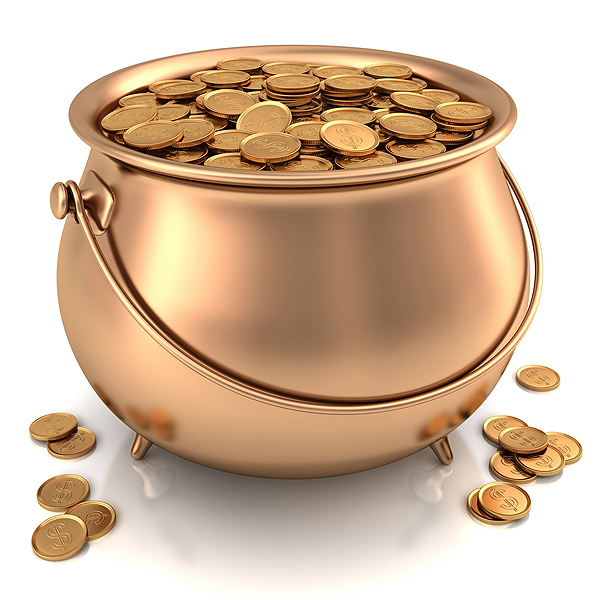 They also can be very generous to those who have done them good by giving away a magic coin, gold or even special wishes. It would be ideal if we all had our own physical magic coin, the key here is to begin to see that you already do. I have a vision this month, to support you in changing your experience with money and opening for you an abundant mentality. The state of our economy would have us believe that abundance is not possible in such times. I can’t accept such a limiting belief. Mark Victor Hansen and Robert G. Allen in their book “The One Minute Millionaire” say that “the state of our mind creates our state of results.” If you truly take a moment to think about this, we are all pretty guilty for what goes on between our ears. A key lesson to be learned from this mindset is the realization of our personal accountability. It would be nice to blame others for our circumstances, but that victim mentality does nothing to improve our situation. On Facebook & Twitter, I will be posting DAILY quotes and affirmations related to money and your relationship with it. We all need reminders of the opportunity to choose our state of mind and thus change the results we are experiencing in life when it comes to money. So come find me on Facebook and Twitter! In addition, I have a special 30 day challenge for you. Below you will find a PDF with 4 affirmations on it that you must download and print out. These affirmations should be repeated morning and night as a simply tool to open your mind to the abundance that exists around you. YOU alone determine how much of that abundance you will partake of. Join me on a SimplyHealed Group Phone Session all about MONEY! Let’s clear out all the negative energy that surrounds it in your life as well as the negative energy you give it. Let’s clear up some of those belief systems that hold you back, whether they are your beliefs or the ones passed down through your family, they aren’t serving you well and are ready to go! Register for the call HERE. I am especially excited to soon present to you a course I have been preparing for your benefit called “30 Days & 30 Ways to Improve your Relationship with Money” This is designed give you something new every day that will change you and how money shows up for you, from the inside out. 30 quick, small & effective activities to support you in your desire to welcome a financially abundant life. Stay tuned for more details on this amazing program. Let’s go get our Pot of Gold!